Science is much more than balancing chemistry equations, doing a taxonomic key for an insect, or calculating forces on an object in physics. Science is about people: courageous people, intelligent people, flawed people—in other words, people just like us. Telling stories about science makes the whole endeavor much more interesting than just learning the dry facts. Stories give us examples to follow and situations to avoid. They challenge us, inspire us, and (occasionally) warn us. Numbers and Kampourakis divide their assessments into three different time periods: medieval and early modern science, 19th century, and 20th century. At the end of the book, they also include a section on generalizations—a collection of myths that span all science disciplines. The resulting collection provides an interesting overview of stories that have grown up over time that do not necessarily reflect what really happened. The medieval and early modern science section does an excellent job in demolishing several common myths. Contrary to popular opinion, there was some scientific progress during what is called the Dark Ages. Many works written by Greek philosophers and others were being translated from the Greek into the generally accepted language of Latin, usually by monks and other religious individuals. The idea of a flat earth was not prevalent at the time of Columbus. Most religious scholars of his day had little problem in arguing for a spherical Earth; however, there was little direct evidence to support or refute these arguments. Alchemy and astrology have been shown to have made significant contributions to chemistry and astronomy, even though their main goals were not achieved. Nineteenth century myths that the authors cover focus mainly on aspects of evolution and the origin of life. In all cases, the reality is much more complex than the stories that evolved. As we look at the 21st century, we see many of these issues arising again. Darwin proposed a theory that could not include the understanding of biochemistry and cell biology that we have today. The ideas of Lamarck were once roundly dismissed and his adherents were often severely punished. Today these issues of how the environment influences heredity are at the forefront of a great deal of research. Social Darwinism appears to be dismissed as a myth, but more recent issues in evolutionary psychology and other social sciences rely strongly on the ideas of Darwin with regard to human behavior. It is only fairly recently that many of these research “findings” have been challenged with regard to both their veracity and their reproducibility. The 21st list of myths is much more ecumenical, dealing with several science fields as well as dipping a toe into the science education debates. The chapter on melanism and peppered moths is rather disappointing since it dismisses or ignores many of the questions raised in recent years about the reliability of the original data. The Millikan oil-drop attempts to determine the charge on the electron point out the many frustrations involved in carrying out experiments that have a large number of variables associated with them. The generalizations that the writers explore are endemic to our current misunderstandings about scientific progress. Scientists certainly do not work alone; any cursory examination of the number of authors on recent science publications would put that myth to quick rest. The scientific method has always been difficult to deal with in science classes. It is not a recipe for success, but an overall process that eventually gets a scientist somewhere. This reviewer has often thought that research papers should be written with more honesty. Instead of describing an orderly series of experiments, it would be refreshing to read, “Well, we tried this but it was a total failure. Quite by accident, we happened upon a trail that got us where we needed to be.” But we know that won’t happen any time soon. The treatment of religion in discussions of these myths is quite interesting. Numbers is generally neutral (and definitely not antagonistic) when it comes to the role of religion in the scientific realm. There are modern ardent atheists who attack religion (often almost violently)—Richard Dawkins, Jerry Coyne, and Sam Harris readily come to mind. But by and large, the intricate history of the relationship between science and religion is much more complex. Often both enterprises interact in a positive manner to look for a greater understanding of the world around us. 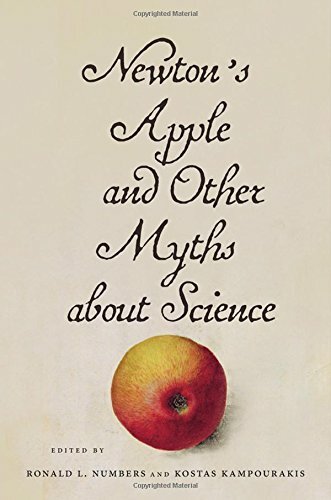 Newton’s Apple is a thoroughly researched and well-written journey through some of the key ideas in science and the real stories behind their development.